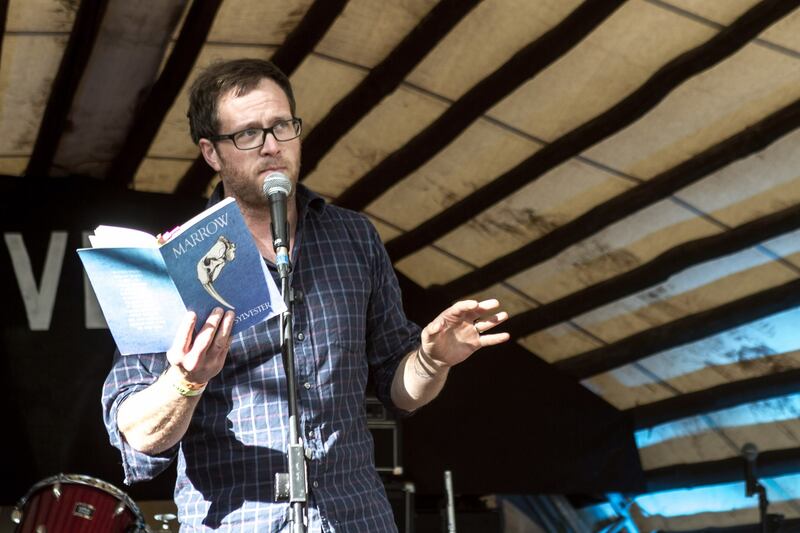 The excellent people at Manchester’s premium spoken word experience Bad Language kindly invited me to join them for a reading at Kendal Calling festival this weekend. Wading ankle-deep through mud to the Carvetti stage in the Lost Eden area, I was humbled to join Mark Powell, David Hartley and host Joe Daly in bringing words to the woods. They are fantastic writers, and it was an absolute delight to hear more of their work. And because we all camped together, I was actually able to have a natter with them afterwards – on the rare occasions Mon and I go to Manchester, we always have to leave early, so it was a pleasure getting to know them better. Good people. Between Dave’s otherworldly species-bending marvels, Mark’s lists of life hacks and surreal perfume adverts, and Joe’s wonderful reinventions of everyday struggles as particular and personal Everests, it was humbling company to keep. I read Coffin Routes, some of my new circus stories and several bits of Marrow. It was a tough and mobile crowd – the stage was right beside a main walkway between much louder stages – but there were gasps, winces and laughs throughout, so I think we held our own. We made the Top 12 highlights of the festival for Gigwise, too. We didn’t catch much else of the festival, but what we caught was fantastic. As always, British Sea Power were magnificent. There aren’t many bands who sustain years of constant reinvention without sacrificing their core identity – Mogwai, for sure, and maybe Super Furry Animals – but BSP are treasures. They made ferocious headliners of the Woodlands stage on Saturday night, tearing through their back catalogue to finish with a sprawling Spirit of St Louis complete with crowdsurfing and Ursa the bear. One day, I will be that bear. One day. That was the sixth time I’ve seen them, and they keep getting better. And then there was Kate Tempest. Mon and I knew and liked what we’d already heard of her work, so thought we’d mosey along to see her set on Friday. We were there early enough to be right at the front for one of the most amazing hours of my life. We thought she’d be good, but she was extraordinary. Brimful of passion, rage, courage and love, she was electrifying from start to finish, scintillating, blazing her way through the set like a sermon. And the music, too, was titanic, walls of sound that towered upward, a perfect fusion with the words. It was magnificent. Near the end of the set, Kate made eye contact with Mon for ten, fifteen seconds, rapped to her, sung to her. For the rest of that night, and the next day, and even now, aftershocks of her performance are still shaking through my life. Nothing seems quite the same. The only downer was missing Seven Seals. They were playing at the same time as the Bad Language set on Sunday. In between readings, I could hear them scorching through their psychedelic synth-punk wonders. More people need to know about Seven Seals. Everyone needs to know about Seven Seals. Go and see Seven Seals. When the reading was done, Mon and I said our farewells to the Bad Language crew and fled while we could, squelching through the swamps to the car. The campsite was a happy, slightly delirious Lord Of The Flies. Festivals and mud. That’s how it goes, right? A hundred tons of woodchip to soak up the swamps. It’s just as well I’m writing about bogs. Kendal Calling proved invaluable research. Thanks again to Bad Language. It was an honour to serve with you, gentlemen. I’m very pleased to share the news that I’ll be appearing at the Bloody Scotland crime writing festival in Stirling this September. Hot on the heels of discussing outsiders and myths with Chigozie Obioma and Fiammetta Rocco at Edinburgh International Book Festival, I’ll be joining Mark Douglas-Home and Kirstin Innes to chat through the wonders of water in crime novels. The sea is a perfect companion to mystery, crime and puzzles, and I’m really looking forward to seeing where we go with it. You should come too. Tickets here! And, if you haven’t already, please vote for The Visitors in the EIBF First Book Award – any and all support very much appreciated.